I generally don’t eat too many sandwiches. Not that there’s any particular reason as I do happen to love my carbs. But lately I’ve had a hankering for a good tasty sandwich. So I came up with this panini with romesco sauce. As zucchini is in season now until the end of August, this is a perfect time to use this summer veggie. If you’re anything like me, you don’t have a fancy panini maker…but don’t fret! You can still make a panini by putting a sandwich in a skillet and then placing another skillet or cookie sheet on top with a can on top of the sheet or pan. And presto…you’ve whipped yourself up some bougie (aka fancy) sandwiches!! As for the sauce, romesco (I just love the way that rolls off the tongue!) is a spread originating from the Catalonia region of Spain. It’s thick and creamy with a little zingy kick to it. If you refrigerate it overnight, the flavors will marinate, really bringing out the zest of the fire roasted sweet peppers. This sauce is so delicious, you’ll want to put it on top of other things, like pasta or pita chips, or just devour it straight from the bowl. Grill or pan fry zucchini and portabella mushroom strips. If pan frying, use a tiny amount of olive oil. Brush one side of every slice of bread lightly with romesco sauce. 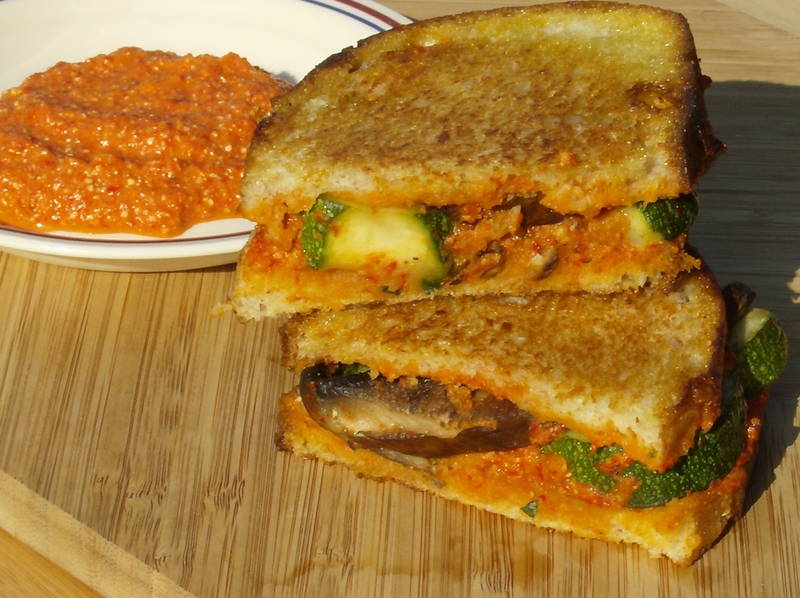 Place zucchini and mushrooms onto the one slice of bread, romesco side, placing another slice of bread on top, romesco side down. Continue with each pair of bread slices. Brush top of each sandwich lightly with oil. Put each sandwich oiled side down in a panini maker. If you don’t have a panini maker, place each sandwich oiled side down in a skillet with a cookie sheet on top of the sandwiches with a can or two on top to give it weight in order to press it. Cook for a few minutes until golden brown. Remove cans and sheet, brush top side of sandwich lightly with oil. Flip and cook on other side. Serve immediately. Place pine nuts and garlic cloves in food processor. Blend until crumbly. Add red peppers and tomatoes. Blend until smooth. If not serving immediately, store in airtight container in the refrigerator for up to 2 days. Previous post ← Papa Don’t Preach: Is Forever 21’s New Maternity Line Glorifying Teen Motherhood? I had to laugh when you mentioned “zuchini”, because yesterday, Deb brought in a bag of huge zuchini’s (and i mean huge! They looked like pods from Invasion of the body snatchers). She was like, “Help yourself!”, but the things weighed about thirty five pounds. Anyway, they were left laying on the break room table. Hmmmm, where did Deb’s zuchini’s end up going?